I’m writing a book! To be precise, two e-books. I started this fashion blog with the intention to bring a little bit more beauty to this world. But only later, it became apparent that I’d like to create something tangible that you lovelies could actually take and use for yourself. My plans were a bit delayed with the launch of SoNailicious which is doing great by the way! But now I feel the time is right to finally reveal the exciting news! …I’m going to write on how to improve and develop personal style. The book will be based on the “Polish Your Style” series and contain practical tips that aim to create a better style with moderate and targeted spending. This book is for real women who want to look chic and who are smart with their money. 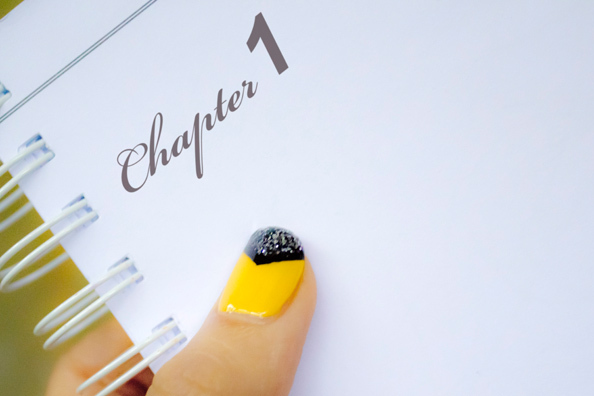 Second, there will be a book… about nail art! Due to an overwhelming amount of inquiries about how I do this or that nail art, I thought such a book would be a useful resource for all nail art enthusiasts. I’ll leave it there for now as there will be a separate announcement about that on SoNailicious soon. So lovelies, here is your chance to get exactly what you want! If you would like me to cover a specific topic on fashion or have a specific question about styling, let me know. Use the comments section below or email me mvlezko@crashingred.com. Enjoy writing the books. I think they will be fantastic as really enjoying your series. This sounds fantastic and I cannot wait to see what you churn out! Congratulations, super excited for you M! This sounds great! I would be keen to hear/read any advice you may have with women who have a small bust as a lot of the mainstream (ie Target Kmart) style clothing is designed for much larger women than me! I always wanted a nail art reference/encyclopedia type book that you can actually turn paper pages on!